Railway Wonders of the World consists of 50 weekly parts, price 7d. The first issue, which appeared on 1st February 1935, was of 36 pages; all the others were 32 pages. The part work was designed to be bound in two volumes comprising issues 1-24 and 25-50 respectively. Each issue comprised a colour cover (featuring a variety of locomotives), an Editorial inside the front cover (“We will talk about trains”), a supplement (either a colour plate, a black and white art plate, or a photogravure centre supplement, included in the pagination), and the main text pages. With the exception of issues 1, 2 and 25, the special plates were bound after page four of the text pages for that issue. The photogravure pages were always bound as centre pages, possibly to add strength for the casebinding service offered as the series completed. In issue 1 the fold-out plate at the front formed the frontispiece, as did the black and white illustration in issue 25. The colour plate at the front of issue 2 was presumably bound there as a further inducement to potential customers. Issue 1 was a “bumper” issue offering 36 pages along with a colour plate featuring a cut-away section of a GWR “King” locomotive, and a photogravure centre supplement on (American) Wonder stations. Only issues 13 and 14 offered anything near this, namely a colour plate and photogravure supplement (issue 13) or two colour plates (issue 14), but each issue was only 32 pages long, not the 36 pages of issue 1. Most other issues fell into a sequence of colour plate, black and white plate, and photogravure supplement, particularly following issue 3. However the sequence is occasionally broken, although not from issue 16 onwards. Only issue 50 appeared without any form of supplement. This is almost certainly because it was the final issue, largely comprising the index to the whole work. This page offers additional information about Railway Wonders of the World as a publishing project. It is intended as an essay describing the work as a whole. 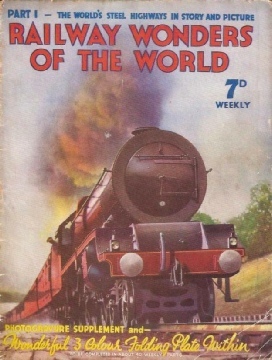 Railway Wonders of the World was published by the Amalgamated Press in 1935-6. It proved the first of several issued by them under Clarence Winchester’s editorship. The series was launched at a good time for the British railway system, near its inter-war peak. Thus the “Silver Jubilee” service is described (issue 45), but the series finished too early to cover the increasing competition between the LMS and LNER which culminated in “Mallard’s” unbroken record of 1938. However this story was picked up in one of the successors to Railway Wonders, the series Wonders of World Engineering. One oddity - to modern eyes - is the part work was not designed so that articles fitted the confines of each issue. Few issues end this way and virtually all end unfinished, with the article being completed with the next issue. The exception is issue 24, which completed volume 1. This method may have been a ploy to sell two issues rather than one, since if an article of interest appeared at the end of one issue, the reader would feel obliged to buy the next issue to complete the story. 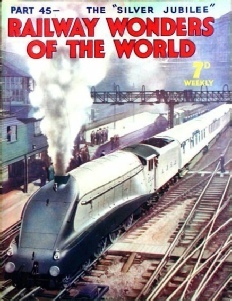 Although much of the first issue was biased to the British railway scene, the overall emphasis was international in scale and scope. Or, as Clarence Winchester declared in the editorial of the first issue “It will form the most comprehensive survey of railway accomplishment yet presented to the public”. The tables of content reveal that volume 1 (issues 1-24) had a slight bias towards British subjects (52 to 46 foreign, and 16 general); whereas volume 2 (issues 25-50) biased towards foreign railways (65 to 37 British and 17 general). As the series completed, a casebinding service was offered to readers. The style chosen became the Amalgamated Press “house style” of a lettered and illustrated spine, with a design impressed into the front cover with the title of the series. 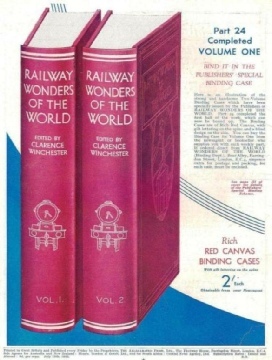 For Railway Wonders of the World the standard casebinding offered was in red or maroon cloth. The spine included a head-on view of a steam locomotive, the title of the series, the volume, and the pagination. The front cover had a design incorporating a cable car. This was offered as a two-volume set, and the binding service removed the outer covers of the weekly parts, so the series was bound with all the appearance of two hardback books with a continuous pagination in each volume. The work was undoubtedly inspired by F. A. Talbot’s earlier work of the same title, published just before the First World War. Some of the topics covered are similar, but overall the later work appears superior, probably due to better printing techniques, and especially the widespread use of colour illustrations. The success of Railway Wonders of the World led immediately to further series published by the Amalgamated Press under the editorship of Clarence Winchester. You can read more about these here.